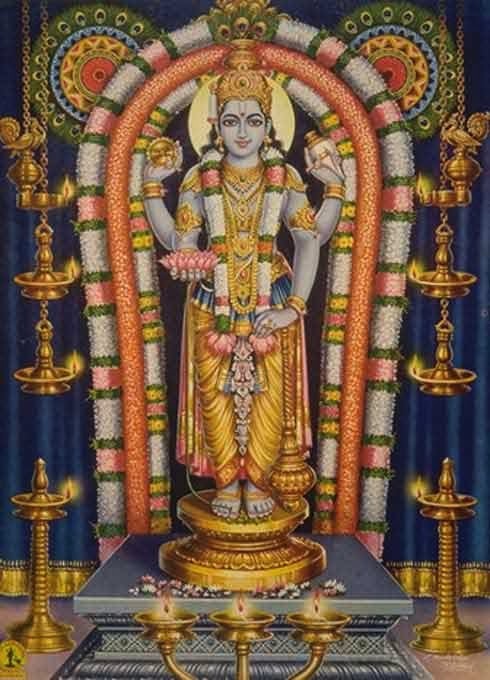 Guruvayur Ekadasi is observed in the famous Sri Krishna Temple at Guruvayur in Kerala. It is observed in the Vrischikam month as per traditional Malayalam calendar. Guruvayur Ekadasi 2019 date is December 8. The corresponding Ekadasi in other regions in some year is known as Mokshada Ekadasi or Prabodhini Ekadasi. The Geeta Jayanti is also observed on the day in certain years. The temple does not close the doors of the Sanctum Sanctorum on Ekadasi day. The temple doors which opens on at 0300 hrs on Dashami, the day before Ekadasi, is only closed at 0900 hrs on Dwadasi Day – the day after Ekadashi. How to observe Guruvayur Ekadasi? Fast on Ekadasi tithi (11th day) and end it before Dwadasi tithi (12th day) ends. Rice, salt and grains are completely avoided on the day. Visit a Krishna Temple and do your prayers. Offer Tulsi leaves and chandan to Sri Krishna. Do regular simple puja at home. Chant “Om Namo Bhagavate Vasudevaya” 108 times. Read Bhagavatam (Srimad Bhagavad Purana) or the Bhagavad Gita. Offer food to cow – help in saving and protecting cow and other animals. Plant Tulsi plants or plant trees and take care of it. One of the most important rituals associated with Guruvayur Ekadashi is the lighting of Ekadasi Vilakku (lamps). It starts a month before the actual Ekadasi day - two Ekadasis before the actual Guruvayur Ekadasi. The entire temple is lit with traditional lamps during the period. The oil and the necessary items required for the ritual are offered by the devotees. On Ekadasi after night pooja the famous Ekadasi Vilakku with elephant procession takes place. Hundreds of devotees arrive to witness this unique event. Lord Guruvayurappan is the owner of the largest number of elephants in India and on the Ekadashi day, there are special elephant processions. A highlight of the Ekadasi is the honoring of the elephant Gajarajan Guruvayoor Kesavan – an elephant that attained legendary status when it was alive and is still remembered and honored at the temple. Guruvayur Kesavan had died on a Guruvayur Ekadasi day. On the day, the leader of the elephants at Punnathur Kotta of the Guruvayur Temple places a garland at the statue of Guruvayur Kesavan and all the elephants stand around and pay obeisance. There is also a grant elephant procession to the nearby Parthasarathy Temple as it is the day when Bhagavad Gita was rendered to Arjuna by Lord Krishna – Geeta Jayanti, which is known as Geethopadesam Day here. On the Dwadasi day, there is a unique custom of offering Dwadasi Panam in the Koothambalam of the temple. The Dwadasi Panam is a token amount of money and it is considered highly auspicious.